We are probably one of the first ones in tech media who publicly released the Leaked technical specs of LG G Flex in detail before its official announcement. 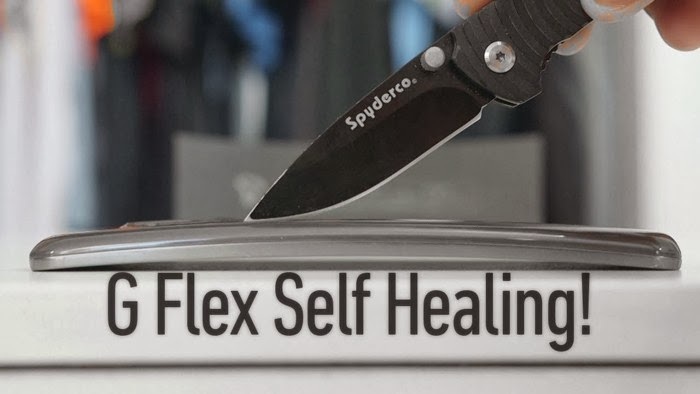 In an official announcement of G Flex smartphone by LG they introduce a unique feature of self healing which is never seen that before at-least in cellular devices. Self Healing is a property that can be found in smart materials (inspired by living organisms) that has an ability to sense and response (can change position, dimensions, etc.) on the mechanical and environmental changes. Smart materials with Self healing property has an ability to heal mechanical damage usually on the application of change in temperature or in the presence of UV light. On G Flex body LG applied a layer of self healing material. Well I'm not 100% sure but possibly LG applied a layer of recently introduced supramolecular polymers technology, a research of Case Western Reserve University. Supramolecular is a solid state healing agent composed of very small molecular chains that disassembles on exposure to light / RT 30°C and flows into the scratch and the surface gets healed. Checkout the following animation that explains how the process of self healing works. Note: LG F Flex is designed to recover from light scratches on its back cover within minutes but, recovery from heavy scratches may be limited.